Vijay's upcoming film with director Atlee, which is currently referred as "Vijay 59", has been making headlines since day one. The latest buzz is that the Raja Rani director is searching for a title for the film. Nowadays Kollywood directors are digging deeper to come out with a unique words to use as the title of their films. Interestingly there are few films including Karthi’s ‘Nan Mahan Alla’ and Ajith’s ‘Arambam’ for which the directors have put more efforts come up with the title. Now we all know that Atlee will be directing Vijay for his 59th film and it is heard that he is looking out for a unique title of the film and is in discussion about it. 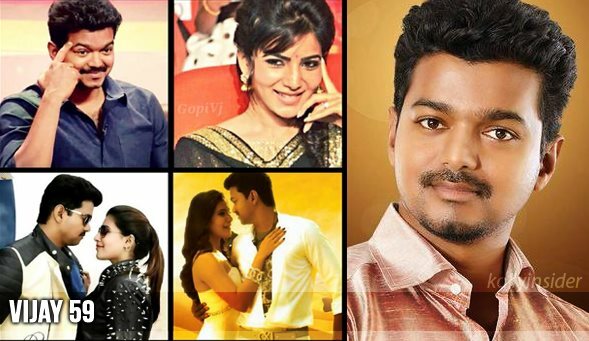 Samantha will be pairing with Vijay. G V Prakash will be composing the music. It is a great surprise that Vadivelu will be donning the comedian role in this film. The films Bhagavathi, Pokkiri, Sura, Kaavalan and Villu which had the combination of Vijay and Vadivelu were great hits. The shooting of the film is to commence during the month of June. "Vijay 59" is said to be an action thriller and will be produced by Kalaipuli S Dhanu. However, the team has not yet revealed anything more about the story. The project is expected to go no floors after the completion of Vijay’s film with Chimdudevan.